The writing of Hans Fallada (1893-1947) spanned many eras of his country’s history. He began writing in Wilhelmine Germany, was deeply marked by the First World War, and flourished in the Weimar period. Unlike most other liberal humanist writers, Fallada stayed on in Nazi Germany. He made some concessions to the new regime, but received no favors (he was officially declared ‘undesirable’), and accompanied its rise and fall with his own virtual self-destruction, which however only finally came after a last period of intense writing under the Soviet Russian administration after 1945. Fallada was a lucid and honest witness of the fate of the ordinary people of his time. His most famous novel — Little Man—What Now? (1932) — became an international bestseller and a Hollywood film. 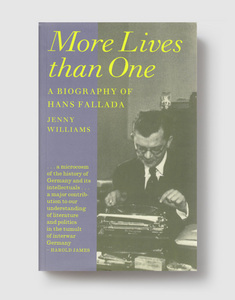 In exploring Fallada’s peculiar, uncomfortable yet hugely productive life, the author explores new ground in German cultural history and throws new light on the German popular psyche in the first hald of the twentieth century. JENNY WILLIAMS is Senior Lecturer in German at Dublin City University. She has worked on Fallada’s life and work for many years. Her biography is based on published and unpublished sources, including family letters and interviews.